1) Dissolution of minerals. Some minerals like halite and other evaporites dissolve very easily in water. Other minerals, particularly silicates, do not dissolve easily. Carbonates are in between and dissolve in acidic waters. (Rain water has a pH of ~5.7 due to dissolved CO2, even without “acid rain” pollution.) The results of dissolution are ions in water that are transported downstream. Ions are not deposited until the water evaporates, they react with other minerals, or organisms use them to make shells. Often, only part of a rock dissolves, leaving sediment that can be transported by wind, water, etc. Alteration of minerals. Silicates do not dissolve very easily, but they do react with water to form new minerals. Feldspars react with water to form clay minerals and ions, olivine reacts with water and O2 to form oxides, clay minerals and ions, pyrite reacts with water and O2 to form oxides and sulfate ions. Iron oxides, such as hematite, are commonly red, giving weathered rocks a rusty hue. Alteration of minerals is one of the main sources of clay minerals and mud-sized grains. 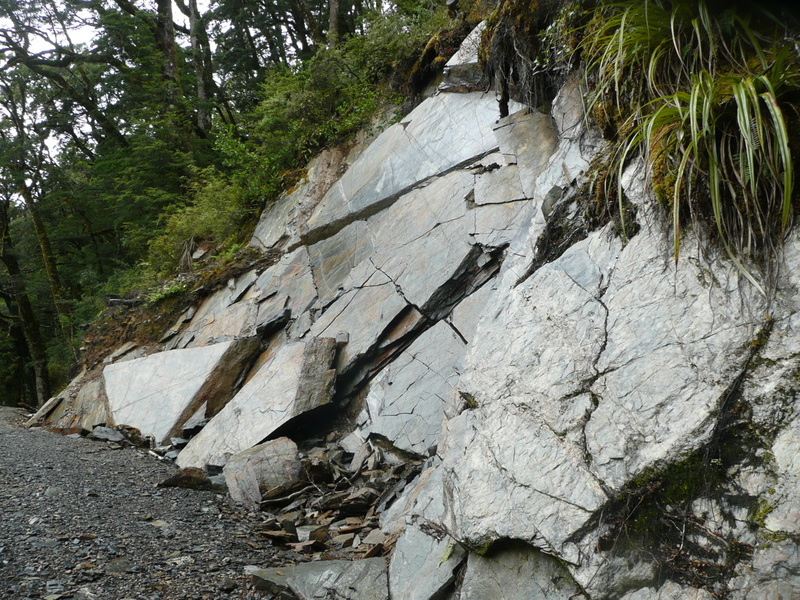 This outcrop originally had the same composition as the rock shown in the previous photograph, but has been exposed to much more water as well as plant-assisted soil processes. Sediments that have been subjected primarily to physical weathering have a mineralogy that is similar to that of the parent rock. If the sediments have been subject to extensive chemical weathering, it is much harder to characterize the source rocks because the composition has changed extensively. Overall, the composition of the resulting sediment depends on the mineralogy of the rock, how it is transported, and the weathering environment. Some minerals alter more quickly than others. Quartz is difficult to dissolve and is hard, so it commonly lasts through both chemical and physical weathering and is the most common mineral in sand on Earth. In contrast, minerals like Ca-feldspar and olivine react to form new minerals quickly. They are substantially less common in sediments. Thus, mafic rocks (which contain Ca-feldspar, olivine and pyroxenes) tend to alter to clay minerals very easily and produce little sand and abundant mud. In contrast, granites (quartz, K-feldspar, Na-feldspar, mica) contains minerals that react more slowly and tend to produce sand-sized grains, especially quartz. The extent and style of weathering is mainly controlled by climate. Water is extremely important, even for physical weathering. The more water present, the faster weathering occurs. Temperature is also important, as discussed for physical weathering. Warmer temperatures also promote faster reactions, so chemical weathering is more effective in warm climates. Thus, warm, humid climates tend to have the most rapid weathering (and poor outcrop). Finally, vegetation has a strong influence on weathering. Plants tend to increase the extent of chemical weathering by producing organic acids that help break down rocks into soil through both dissolution and alteration. They also help soil retain moisture, increasing the availability of water for weathering, and their roots can help widen cracks. Once sediment is produced by weathering, it is available for transport. The two main forces in erosion are fluid flow and gravity. Fluid flow is what we talk about most, e.g. glacial erosion of sediment, wind blown sediment, and mostly water flow. Flowing water is the biggest influence in erosion because it is very common and effective at transporting sediment. Erosion by water occurs when water is flowing across a surface and the flow is capable of transporting more sediment than is currently moving as bedload. This is called the sediment transport “capacity”. A certain number of grains of a certain size can be picked up by the Bernouli effect for a given flow. If there are too many grains, they start colliding and and the characteristics of sediment transport change. Grains are directed back toward the bed and up into the flow. Eventually, more go back to the bed than are lifted into the flow, and sediment is deposited. Sediment can be deposited even at high flow speeds when there are more grains than the transport capacity of the flow. * In contrast, if there is a shortage of grains that are small enough to be transported by the flow, e.g. the flow is moving all of grains present, any new grains will be eroded off the bed as soon as they are available. The flow then has excess transport capacity. One of the most common times for a flow to have excess transport capacity is when the flow is speeding up. We know from the Hjulstrom diagram that faster flows transport larger grains. They can also transport more grains. Thus, water flowing from a shallower slope to a steeper slope commonly speeds up, has excess capacity and erodes sediment. When it slows down, the transport capacity decreases, and sediment is deposited. In floods, the water speeds up, erodes sediment, and transports it. As the flood ends or flood waters extend over larger areas, the water slows down and deposits the excess sediment. In general, erosion occurs when flows are speeding up or when they go from an environment with low sediment (e.g. a dam spillway) to an environment with more sediment (e.g. a river bed). Usually, the concentration of sediment is very high in gravity flows, which means that the grains collide with each other frequently. Grain collisions can help keep the flow moving. The collisions also keep the different grain sizes from being sorted out, and many of gravity flow deposits are poorly sorted. 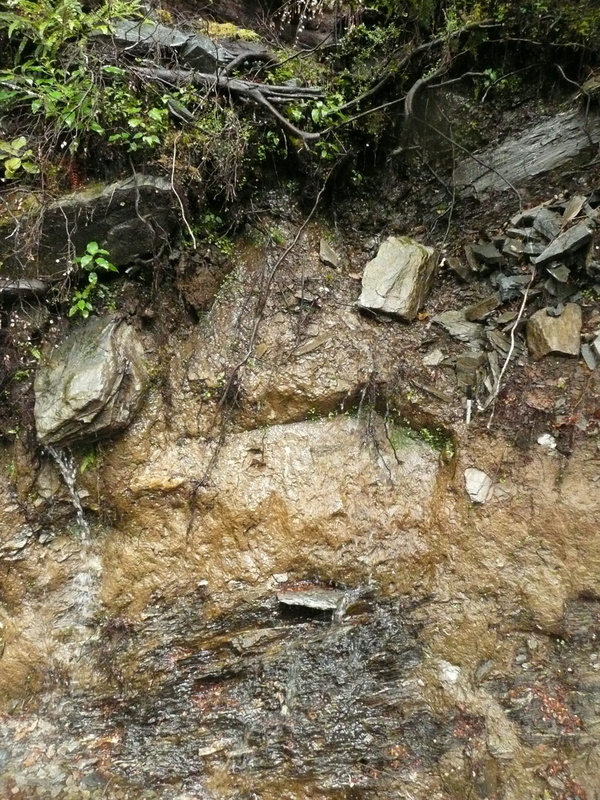 If lots of mud-sized sediment is present, the viscosity of the flow is high, and the flows can be laminar, which produces very poorly sorted deposits. These are often called mud flows or debris flows. Watch the videos again, and predict the characteristics of the sediment that would be deposited by the different processes.